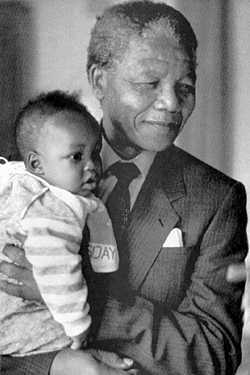 Mr Mandela was born into the royal family of the Tembu at Qunu, near Umtata, on 18 July 1918. The capital of the former Transkei, and now of the Eastern Cape Province. Umtata was named after the Mtata River upon whose banks it was formed. His father was the principal councillor, to the Acting Paramount Chief of Thembuland. However, influenced by the cases that came before the Chiefs court, he was determined to become a lawyer. Hearing the elders stories of his ancestors valour during the wars of resistance in defence of their fatherland, he dreamed also of making his own contribution to the freedom struggle of his people. After receiving a primary education at a local mission school, Nelson Mandela was sent to Healdtown, a Wesleyan secondary school of some repute where he matriculated. He then enrolled at the University College of Fort Hare for the Bachelor of Arts Degree where he was elected onto the Student's Representative Council. He was suspended from college for joining in a protest boycott. After his suspension, he went to Johannesburg where he completed his BA by correspondence. He took articles of clerkship and commenced study for his LLB. He entered politics in earnest while studying in Johannesburg. At the height of the Second World War, a small group of young Africans banded together. These young people set themselves the formidable task of transforming the ANC into a mass movement. Deriving its strength and motivation from the unlettered millions of working people in the towns and countryside, the peasants in the rural areas, and the professionals. ii.in the rest of the African continent. b.the admission of the Africans into the full citizenship of the country so that they have direct representation in parliament on a democratic basis. Mandela soon impressed his peers by his disciplined work and consistent effort. He was elected to the Secretaryship of the Youth League in 1947. In 1948 the National Party came to power in Southern Africa. During the whole of the 1950's, Mandela was the victim of various forms of repression. He was banned, arrested, and imprisoned. For much of the latter half of the decade, he was one of the accused in the mammoth Treason Trial from 1956 to 1961. This was at great cost to his legal practice and to his political work. The government responded with the largest military mobilisation since the war. In 1952 Mandela himself was elected to the NEC at national conference. Mandela and his co-accused had consistently advised their followers to adopt a peaceful course of action and to avoid all violence. For his part in the Defiance Campaign, Mandela was convicted of contravening the Suppression of the Communism Act, and given a suspended prison sentence. Shortly after the campaign ended, he was also prohibited from attending gatherings and confined to Johannesburg for six months. During this period of restrictions, Mandela wrote the attorneys admission examination and was admitted to the profession. 1961 With the ANC now illegal, the leadership picked up the threads from its underground headquarters. Nelson Mandela emerged at this time as the leading figure in this new phase of struggle. Under the ANC's inspiration, 1,400 delegates came together at an All-in African Conference in Pietermaritzburg during March 1961. Mandela was the keynote speaker. In an electrifying address he challenged the apartheid regime to convene a national convention, representative of all South Africans to thrash out a new constitution based on democratic principles. Failure to comply, he warned, would compel the majority (Blacks) to observe the forthcoming inauguration of the Republic with a mass general strike. He immediately went underground to lead the campaign. Although fewer answered the call than Mandela had hoped, it attracted considerable support throughout the country. The government responded with the largest military mobilisation since the war, and the Republic was born in an atmosphere of fear and apprehension. Moving from place to place, forced to live apart from his family, to evade detection by the governments ubiquitous informers and police spies. 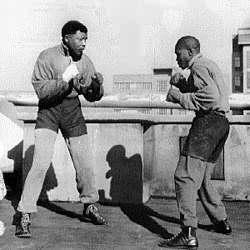 Mandela had to adopt a number of disguises, sometimes dressed as a common labourer, at other times as a chauffeur. His successful evasion of the police earned him the title of the Black Pimpernel. It was during this time that he, together with other leaders of the ANC, constituted a new specialised section of the liberation movement. Umkhonto we Sizwe, an armed nucleus with a view to preparing for armed struggle. At the Rivonia trial, Mandela explained : "At the beginning of June 1961, after long and anxious assessment of the South African situation, I and some colleagues came to the conclusion that as violence in this country was inevitable, it would be wrong and unrealistic for African leaders to continue preaching peace and non-violence at a time when the government met our peaceful demands with force. Not long after his return to South Africa, Mandela was arrested and charged with illegal exit from the country, and incitement to strike. Since he considered the prosecution a trial of the aspirations of the African people, Mandela decided to conduct his own defence. He applied for the recusal of the magistrate, on the ground that in such a prosecution a judiciary controlled entirely by whites, was an interested party and therefore could not be impartial. And on the ground that he owed no duty to obey the laws of a white parliament, in which he was not represented. Mandela rejected an offer of release on condition that he renounce violence. Prisoners cannot enter into contracts. Only free men can negotiate, he said. In April 1984 he was transferred to Pollsmoor Prison in Cape Town. 1988 he was moved the Victor Verster Prison near Paarl. Released on 11 February 1990, Mandela plunged wholeheartedly into his life's work. Striving to attain the goals he and others had set out almost four decades earlier. In 1991, at the first national conference of the ANC held inside South Africa, Nelson Mandela was elected President of the ANC. His lifelong friend and colleague, Oliver Tambo, became the organisation's National Chairperson. Despite terrible provocation, he has never answered racism with racism. His life has been an inspiration, in South Africa and throughout the world. To all who are oppressed and deprived, and to all who are opposed to oppression and deprivation. In a life that symbolises the triumph of the human spirit over mans inhumanity to man, Nelson Mandela accepted the 1993 Nobel Peace Prize. He accepted the award on behalf of all South Africans who suffered and sacrificed so much, to bring peace to our land.